I’m the baby! Gotta love me! Anyway, this is what I thought of yesterday when my adorable beagle Blue decided she needed my attention while I was knitting the ribbing for my sweater. I hate that part…. 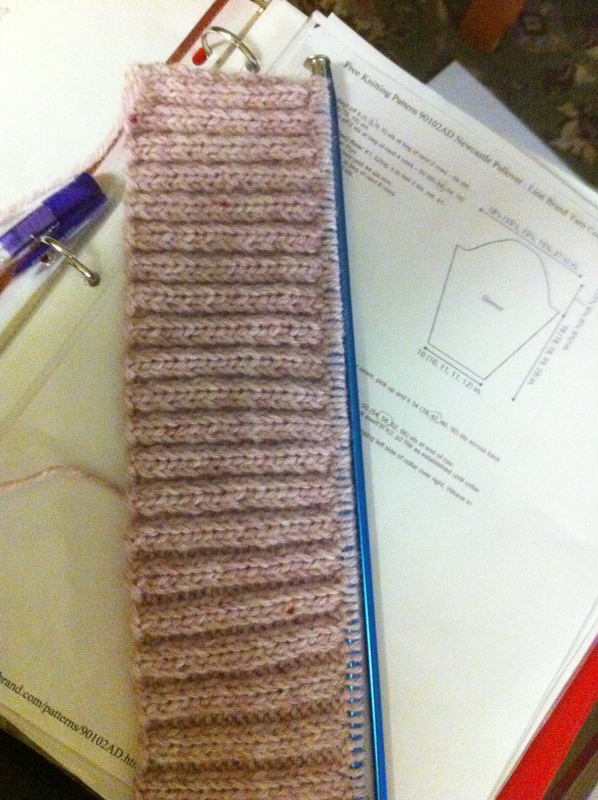 knit two, purl two, knit two, purl two…. I always get screwed up somewhere along the way especially when I’m not feeling well, like now. So I was almost finished with the 3 inches of ribbing I needed when she suddenly jumped in my lap and spun around. One of her nails hooked into my knitting and it spun around with her and the yarn wrapped around her too. THEN she rolled onto her belly in my lap and I sat there horrified as I looked at my knitting still stuck to her foot. The needle was just barely hanging on and several stitches were racing for the finished line. I unhooked it from her foot but just then she leapt over my back and down the arm of the couch to the floor where she again laid on her belly for belly rubs. So now the knitting is wrapped around her and me and I’m trying to hold onto the yarn that is tying us together to keep it from undoing any more. That’s when she looked at me with those big brown eyes and I knew I couldn’t be mad at her. She just wanted me to love her and she is soo lovable! It’s hard being a beagle in Alaska when it’s too cold to go out and play. So now I have it all fixed. I got it all untangled (which was funny because I had a pencil in my hair and the yarn was hung on that LOL), used a crochet hook to fix all the dropped stitches and finished re-knitting until I got the required 3 inches. That’s when I noticed a few wrong stitches that I hadn’t noticed before. There were two purl stitches that should have been knit stitches just two rows down and then there was one purl that should have been a knit stitch that was 11 rows down! UGH! It was also a couple of inches from the end too so I had to be very careful to keep the needle on the left from sliding out while fixing the dropped stitch. So that’s what I’ve been doing today… fixing. I can’t make a sweater with mistakes and this is the front. I have to say too that I HATE HATE HATE these needles. They are long and slickery as snot! I kept dropping stitches because they slid off so easily, especially when switching between knit and purl stitches. I would have knit this using circular needles but I don’t have the size needed for the ribbing. I actually didn’t have the needle for the stockinette section either until last week. I can’t believe I did the entire back section with these long straight *slick as snot* needles but now I have a new set of size 9 circulars to switch to for the stockinette section that is next. I’m so glad! I really like bamboo but I am broke right now so I have to use what I’ve got and I had to buy the circulars that Walmart had (same brand blah!) because they were half the price of the nice bamboo needles as joanns. Plus, by buying them at Walmart my husband doesn’t freak out when he sees JoAnns on the credit card. At walmart it could be groceries LOL I’m a good girl, really I am. Okay, so I was telling a friend of mine about my box collection and I thought I would share some pictures of my boxes. I really love anything that holds anything…. especially when I can find a treasure that *exactly* fits inside it. That just makes my heart jump and spin (kinda like Blue does). So I’m going to post about one box a day starting with one of my most treasured boxes. I got this one from my big sister after my mom died. The top of it looks like Angel wings and it has a little bit of sparkle here and there in the wings. 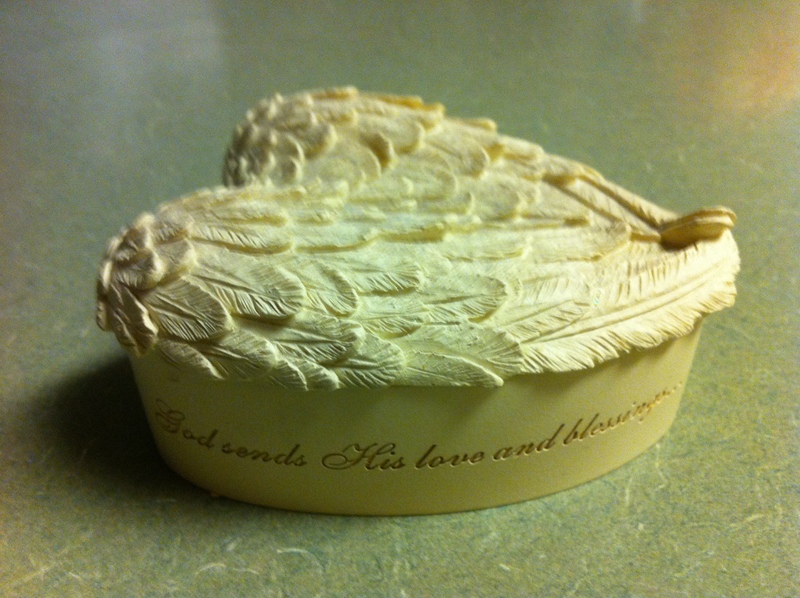 On the sides it says “God sends his love and blessings…with wings of Angels”. Inside, on the bottom is a small feather that also sparkles. The bottom is the best part though. That is where my sister wrote me a note. Sorry, but I was laughing to beat the band at the Blue/yarn/pencil in the hair fiasco! I’m glad you finally got everything back in order and the mistakes fixed, too. How could you resist those eyes? Yes, I remember Dinosaurs. You made me google–1991-1994. Loved the naughty baby! Remember–“Not the Mama!” LOL! I will LOVE seeing all your boxes and containers!!! Whoohoo! This one is just lovely. The feather inside is so sweet, too. Wow! I can see why this is your favorite…for many reasons. Yes, I say that all time time when my kids are not listening to me or Jared decides something in my kitchen should be different. I say “NOT THE MAMA!” and since they don’t know about the show they just think I’m crazy. No wonder they dont know too! Jared, my oldest, was born in 1994. So this is from the year I got married to the year my first son was born! Funny, that seems like a lifetime ago! I still feel really sick – sticking to my cornflake diet still. I have faith in protonix though. Last time I started feeling better after a week on it. It’s only been a couple of days. I’m glad I could make someone else laugh because it sure wasn’t funny at the time LOL Thanks for coming by! 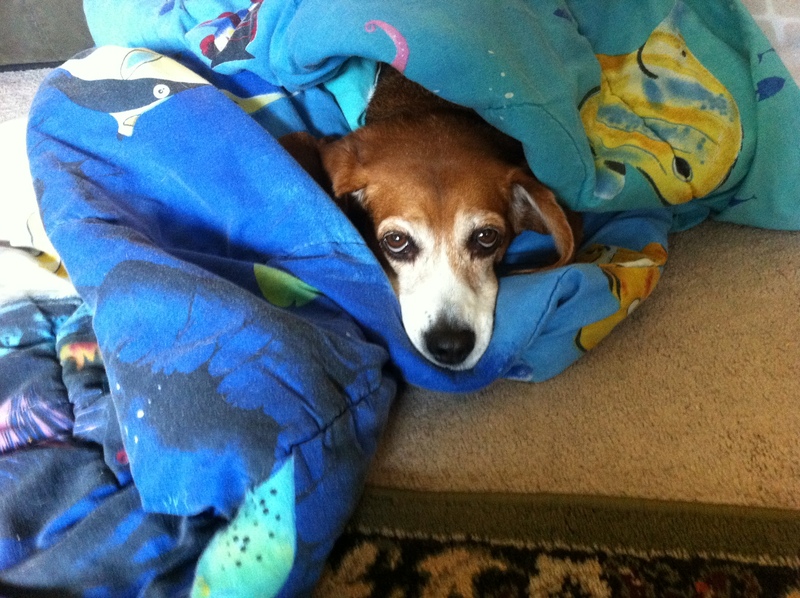 Poor Beagle, but I’d love to visit Alaska and experience a different climate…don’t mind the cold. This box has such an amazing lid…love it! Love the pic of Blue! What a sweetie and certainly irresistible with those eyes! Goodness, Blue certainly got your knitting in a tangle….glad you managed to sort it out and, of course, you couldn’t get mad….just look at those eyes. Crochet hooks are fabulous for picking up dropped stitches in knitting. I didn’t really care too much for the Dinosaurs show myself but I do remember it as my Mum was crazy over it…..she even had a large stuffed Baby Dinosaur that said, “Not the Mama”, when you squeezed its hand. Her favourite character. 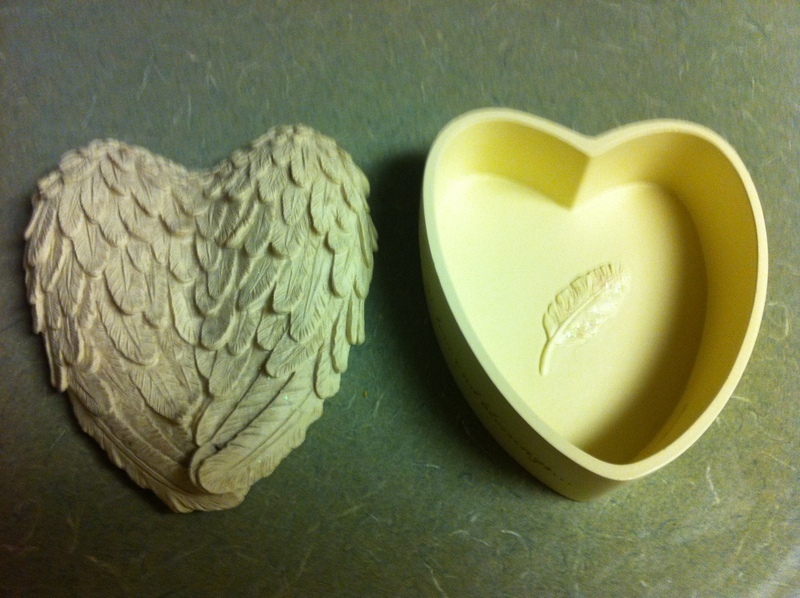 My sister is really special… she likes angels because her name is Angela so she is always sending me angel things but she knows I have a box collection and that one was so perfect for me.